Last week we told you to expect Motorola to launch a global version of its Droid Turbo smartphone (which is exclusive to Verizon). Back then rumor had it that this would be called Moto Maxx, and today the name has been confirmed. 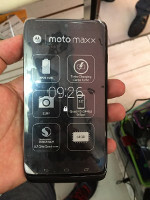 A Brazilian national on Google+ posted a few pictures showing the Moto Maxx in all its glory, and you can feast your eyes upon it too (click the thumbnails for full size images). 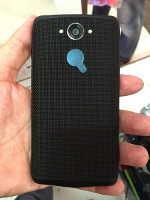 As you can see, the Moto Maxx looks exactly as much like the Droid Turbo as an identical twin should. The Maxx is expected to sport the exact same specs too, and a few of these have been confirmed by the leftmost image above. So the Moto Maxx will have a 5.2-inch QHD (2,560x1,440) touchscreen, a 21 MP rear camera, a 3,900 mAh battery, 64GB of built-in storage, Turbo Charging capability, and it will be powered by the Qualcomm Snapdragon 805 SoC, complete with a 2.7 GHz quad-core CPU - just like the Droid Turbo. 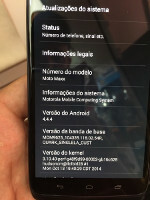 The unveiling of the Moto Maxx will take place in Brazil on November 5, which is this Wednesday. So we've only got a couple of days to wait for it to become truly official. wow!! please release it in india for around 35k.. love this so much.. coz its better than every other phones available..
that all cool and everything, but when on earth will the moto droid turbo release in asian markets!!!!!? make this phone officially global and stop being unfair! I have a Moto X (1st gen) and a Moto G that I got from Orange, but will they sell the Moto Maxx ? ?